Cat Chat With Caren And Cody: My Mother' Day Gift To You! My Mother' Day Gift To You! 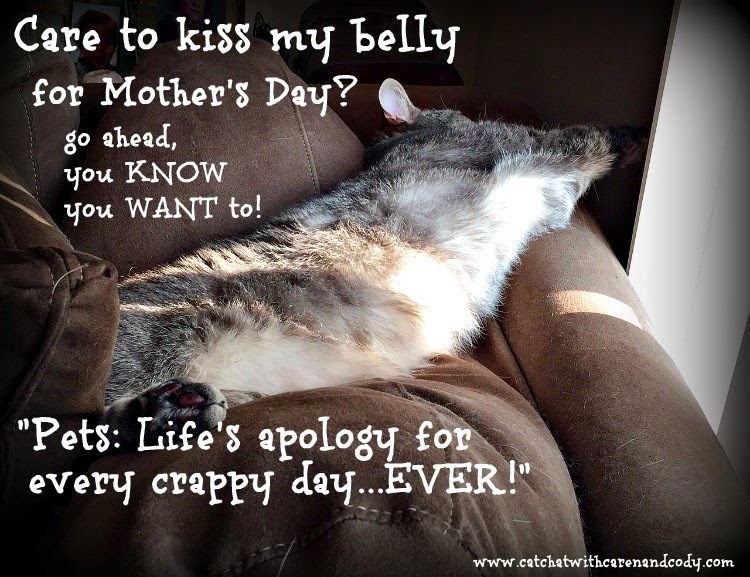 To all of the purrfect Mommies out there! a Mother's love is just the same!! We wish your mom a happy Mother's Day too, Cody. Happy Mothers Day to your human! My human has mother issues, so we have agreed to celebrate Administrative Assistants Day instead (that was last month!). Are ya sure da tummy rub ain't a present for you? it's for me AND anyone who appreciates my ample belleh. What a great Mom's Day greeting Cody!!! We hope you and your Mom have a special day together celebrating LOVE...........that's what we're gonna do at my house! Happy Mother's Day to your mom, Cody! Purrs from Allegra and Ruby and hugs from me! Happy Mom's Day! My kitties started out by waking Mom up extra early which really isn't very nice at all! Happy Mother's Day to you as well! Hope you have a wonderful day! Happy Mother's Day to your very special Mom from all of us! Give that Mom a head bump from me! Awww, so precious and thank you. You can kiss my ears before I kiss your belly near those claws, but worth a try. Watch out! Our mom is on her way over to smooch your belly now, Cody! Happy Mom’s Day to your Human. We love her too! We will kiss you on that belly of yours! Happy Mother's Day!!! Happy Mother's Day to all the Moms and ESPECIALLY YOURS! And Cody, my Mommy wants to snorggle that beautiful Belly! That is just perfect and you know it's totally true that pets are the best gifts on a crappy day! We couldn't agree more! A Happy Mom's Day to you, Cody...and family! Very sweet photo and sentiment. I will kiss your belly- thank you :) Happy Mother's Day to your Mom. Look at that cute belly!!! Happy Mother's Day! Mother's Day is earlier in the year here, but my mum would still like to kiss your tummy. Happy Mother's Day Caren! Happy Mothers day to your Mom! Mom wants to snorgle your belly! Happy Mother's Day to your mom, Cody! You're right, our own human sure would LOVE to kiss your belly! Smooches! Here it's not mother day, but we wish to your mum and all the mums a happy mother's day. Yep, cat belleh is the bestest! A Happy Mother's Day to all! Now Cody, that is one terrific Mother's day present to your Mom. We know she liked that big time.We also wish your Mom a great Mother's day today. Hope she had a good one. You all take care. I think your Mom really appreciates that show of belleh, Cody!! :) Happy Mother's Day! The mom is going in for a snorgle, Cody! Happy Mother's Day to your mom! Happy Mother's Day to you! Love that belly! Oh yeah, great minds think alike. Humans are so very predictable. It's the belleh that will be their downfall as a race.